That lyric comes from the song, “Misletoe and Holly” which was originally recorded by Ol’ Blues Eyes, the renowned Chairman of the Board himself, Mr. Francis Albert Sinatra. What few people realize is that this delightful ditty also marked Frankie baby’s debut as a composer. 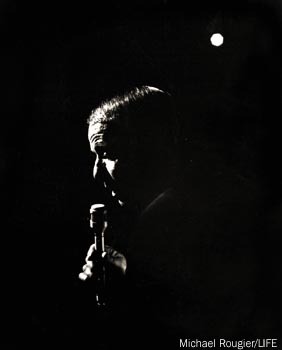 In the pre-Beatle days of the 1950s, when the head Rat Packer recorded his self-penned Christmas song, it wasn’t standard practice for performers to pen their own material, and Frank was no exception, excepting, of course, for “Oh By Gosh...” Frank’s precious pipes relied upon such composers as Sammy Cahn and Jimmy Van Heusen for the hits with which he wowed the bobbysoxers and the Mafia hit men who comprised his audience. Frank also relied upon other lyricists and tunesmiths when he was hit with writer’s block when trying to write the first line. Frank’s always reliable gut told him that “Oh by” and “By golly” were absolutely essential words with which to open the song, providing as they do, a “hook” that reels in the listener, but no matter how often he scratched his already balding head for inspiration, one word remained elusive. “Oh by (something), by golly” just wouldn’t do, so Frank, a man with much clout as a result of his standing in the entertainment world, as well as his wiliness to perform horrible acts of violence on anyone who displeased him, called in professional help. 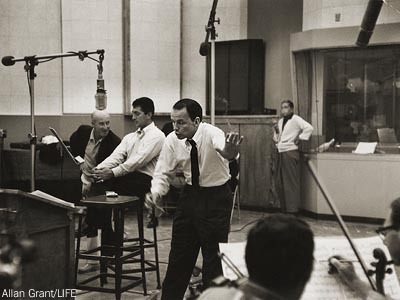 Sinatra’s servants were notified, and the Chairman of the Board, whose only contributions to the session were some profane threats accompanied by his trademark snapping of the fingers, was awakened. The song, now complete, was forever preserved on wax in a hastily arranged post-midnight session at Capital Records in Los Angeles. There was only one Sinatra (unless you count Frank, Jr., Nancy, Tina, and the rest of his brood), and there’s only one Sinatra penned Christmas song. So this year, loosen that bow-tie, snap those fingers, light a Lucky (or a Camel, if, like Mr. Sinatra, that is your preference), and celebrate the holidays by singing along with Frank. © 1996 by Brian W. Fairbanks.